To Cite: Ghodrati M, Pournajafian A, Khatibi A, Niakan M, Hemadi M H, et al. 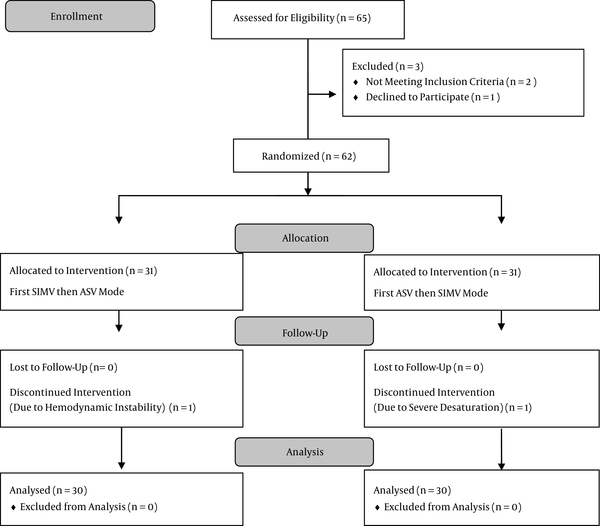 Comparing the Effect of Adaptive Support Ventilation (ASV) and Synchronized Intermittent Mandatory Ventilation (SIMV) on Respiratory Parameters in Neurosurgical ICU Patients, Anesth Pain Med. 2016 ; 6(6):e40368. doi: 10.5812/aapm.40368. Background: Various modes of mechanical ventilation have different effects on respiratory variables. Lack of patients’ neuro-ventilatory coordination and increasing the work of breathing are major disadvantages in mechanically ventilated patients. Objectives: This study is conducted to compare the respiratory parameters differences in Adaptive support ventilation (ASV) and synchronized intermittent mandatory ventilation (SIMV) modes in neurosurgical ICU patients. Methods: In a crossover study, patients under mechanical ventilation in neurosurgical ICU were enrolled. The patients alternatively experienced two types of ventilations for 30 minutes (adaptive support ventilation and synchronized intermittent mandatory ventilation). The respiratory parameters (tidal volume, respiratory rate, airway pressure, lung compliance, end-tidal carbon dioxide, peripheral oxygenation and respiratory dead space), hemodynamic variables, every 10 minutes and arterial blood gas analysis at the end of each 30 minutes were recorded. Results were compared and analyzed with SPSS v.19. Results: Sixty patients were involved in this study. In ASV mode, values including peak airway pressure (P-peak), end-tidal carbon dioxide (EtCO2), tidal volume and respiratory dead space were significantly lower than SIMV mode. Although the mean value for dynamic compliance had no significant difference in the two types of ventilation, it was better in ASV mode. Conclusions: ASV mode compared with SIMV mode can lead to improve lung compliance and respiratory dead space. Mechanical ventilation is one of the common supportive therapeutic methods for many hospitalized patients in intensive care units (ICU). There are different modes used in these settings that all have advantages and disadvantages. The synchronized intermittent mandatory ventilation (SIMV) mode is one of the most commonly used ventilation modes in the ICU (1), which allows the patient to have spontaneous breathing along with mandatory breathes by machine in a coordinated process. This mode is used extensively for patients with different levels of respiratory failure. Moreover, SIMV is typically employed for the process of patients weaning from ventilators, but like many other ventilation modes it has its own shortcomings in which the increasing of the patients effort of breathing is noticeable. Marino PL (2) indicated that in cases which need triggering of machine by the patient, even with the onset of mechanical inhalation, especially if the airflow is fixed, the patients respiratory efforts (which is probably due to chemical feedback) is continued and leads to the increase of breathing work and muscle fatigue (3). Various studies confirm that the separation of the patient from the SIMV mode is a long process. This will lead to longer hospitalization, use of more sedatives, more drug and post-hospital complications and more treatment expenses for patients and subsequently the healthcare system (4). On the other hand, the adoptive support ventilation (ASV) mode is a newer mechanical ventilation method that is a kind of closed-loop pressure-controlled ventilation mode. In this type of ventilation, the respiratory rate (RR) and tidal volume (TV) is specified by the machine in a way that inflicts the least effort when it comes to breathing by the patient (5). In ASV mode, the internal sensor of the ventilator could effectively monitor body ventilation parameters. In addition, internal sensor of this device can also effectively monitor the parameters of patients ventilation that regulate the airflow speed based on the needs of the patient and the mechanism of respiratory muscles, which can lead to a more desirable coordination between the patient and mechanical ventilation machine. In this mode, the operator enters the patient’s body weight and sets the desired percentage of minute ventilation. The expiratory time constant is determined by analysis of the expiratory low-volume curve, adjusting inspiratory pressure, inspiratory-expiratory time ratio and respiratory rate to obtain the prescribed minute ventilation. It therefore adjusts inspiratory pressure, inspiratory-expiratory time ratio and mandatory respiratory rate to maintain the target minute ventilation and respiratory rate within a framework designed to avoid both rapid, shallow breathing and excessive inflation volumes (6). A review study illustrated that this ventilation mode decreases the hospital stay and its resultant expenses (7). Although, the ASV mode has more advantages over the conventional methods of mechanical ventilation there are not enough studies concerning the evaluation of ASV mode and its effect on the respiratory parameters. Therefore, further studies are required for selecting the best mode. The aim of this study is to compare the respiratory parameters by applying Adaptive support ventilation (ASV) and synchronized intermittent mandatory ventilation (SIMV) modes in neurosurgical ICU patients. This is a crossover clinical study on patients hospitalized in the neurosurgical ICU of Firoozgar hospital, from April 2014 to April 2015. The study is approved by the ethics committee of Iran University of Medical Sciences (with accordance to declaration of Helsinki) and registered in the Iranian registry of clinical trials with the ID: IRCT2015112016151N3. Written informed consent was obtained from the patients’ surveillant and guardians. The patients were hospitalized for any decreased level of consciousness due to brain damage (other than severe respiratory failure) that required mechanical respiratory support in the Neurosurgical ICU. The inclusion criteria includes hemodynamically stable patients without using vasopressor drugs between the age of 20 and70 years, no acute renal failure (BUN, Cr, and normal electrolyte) and no serious respiratory disease (no record of confirmed obstructive disease and bronchiectasis, no restrictive lung disease). The exclusion criteria includes severe respiratory failure, unstable hemodynamics, existence of any brainstem lesions, pregnancy, smoking, obesity (BMI > 30) (8) and heart failure (EF < 45%) (9). The total sample size was calculated by the following parameters: effect size = 0.5, α err prob = 0.05, Power (1-β err prob.) = 0.95 and the output result was 54. A questionnaire including demographic and clinical information including, the underlying disease, age, height and weight were filled-up for each patient. A digital scale weighed all patients that were awake and alert. In cases of decreased level of consciousness before being admitted to the hospital, we used the weight mentioned by the guardians or their predicted weight. In case of necessity for sedation to reach the score of 3 to 4 based on the Ramsay sedation score, 1 mg midazolam and 50 µg/h Fentanyl intravenous was used. In unsuccessful cases for sedation, 10 µg/kg/min propofol was added to the compound. In order for intubation, a tube 7 or 8 mm ID was used for women and men respectively. At the beginning of trial, endotracheal tube patency and absence of secretion was tested for each case. Half of the patients were first ventilated with the SIMV+PSV respiratory mode for 30 minutes with the following setting (FiO2 = 50%, TV = 10 mL/kg, PEEP = 3 - 5 cmH2O, ASB = 10 cmH2O, RR = 12/min). The ETCO2 was set around 30 to 35 and variables by changing respiratory frequency. Maximum inspiratory pressure (P peak), expiratory tidal volume (TVe), respiratory rate (RR), mean arterial pressure (MAP), Peripheral blood oxygen saturation (SPO2), and ETCO2 were recorded every 10 minutes. At the end of 30 minutes, ABG was also taken from patients as well as lung dynamic compliance (TVe/ P peak) and dead space, which were calculated by using the Bohr equation (10). Consequently, patients’ ventilation was changed to ASV respiratory mode for another 30 minutes. We entered the patient’s body weight and set the desired percentage of minute ventilation (MV = 100% set as ideal patient body weight) and the above variables were recorded again. In this mode, two additional parameters, specifically ideal body weight, based on gender and height of the patient and support percentage (percentage by volume of ventilation per minute, which is mandatory transformed to the patient by the machine) were defined for ventilator. The ventilator determined the expiratory time constant by analysis of the expiratory low-volume curve, adjusting inspiratory pressure, inspiratory-expiratory time ratio and respiratory rate to obtain the prescribed minute ventilation set by the operator. Regarding randomization, in the second group, ordering of modes was changed (fist, ASV and then SIMV). In fact, all patients in both ventilation modes were allocated in intervention. At the end of the study, patients were ventilated using the routine methods of the SIMV mode. Monitoring of vital signs and oxygenation was made using Alborz B5 made by the Saadat company in Iran and the monitoring of end-tidal carbon dioxide was implemented by using the microstream model capnosafe 1(France). Data related to respiratory mechanics variables were gathered by using the Hamilton ventilator machine, Galileo model (made in Switzerland). Sample volume was calculated by using a comparison formula between two interdependent means. All analyses were conducted using software SPSS v.19 (IBM, SPSS, USA). Quantitative data was shown as the mean while the standard deviation and qualitative data was shown as the frequency. Chi-square test or Fisher’s exact test were both used for evaluating the qualitative data and the T test for independent samples was used for the analysis of quantitative data. P-values less than 0.05 were considered significant. A total of 65 patients were enrolled in this study. Five patients were excluded due to different reasons; therefore, the final analysis was performed on 60 patients (Figure 1). 32 patients (53%) were men with the mean age of 54 ± 6 years and with the range of 45 to 67 years old. The calculated IBW for patients was in range of 50 - 80 with the mean of 65 ± 7.6 kg. Regarding arterial blood gases (ABG), PH, PaCO2, Pao2, and O2SAT levels we revealed that ventilation by two modes of ASV and SIMV has no significant difference. Moreover, in regards to the mean heart rate (HR), mean arterial blood pressure (MAP), peripheral arterial blood oxygen saturation (Spo2), and minute ventilation (MV), the patients under ASV and SIMV ventilationthere had no significant differences but the sum of spontaneous and mandatory breathing in two types of ASV and SIMV ventilation had as a significant difference, as the average number of breathing in ASV and SIMV modes was 20.5 ± 5.9 and 17.2 ± 6.2 per minute, respectively (Table 1). Expiratory tidal volume (6.8 ± 1.8 vs. 10 ± 1.2), dead space (66.8 ± 56.3 vs. 91.9 ± 71.2), peak airway pressure (17.3 ± 4.2 vs. 21.5 ± 5.0) and E-T CO2 (34.6 ± 5.3 vs. 32.6 ± 4.7) findings showed significant differences and better results in ASV group (Table 2). Although dynamic compliance showed better results in the ASV mode group there was no significant difference (Table 2). The present work demonstrated that in patients who were hospitalized in the Neurosurgical intensive care unit, the use of ASV mode compared with the SIMV mode made a significant difference in some respiratory parameters. Although it had no special effect on the patients arterial blood gas variable the use of ASV mode ventilation will lead to a significantly less peak airway pressure, dead space, expiratory tidal volume and at the same time more dynamic compliance (although not significant). This means the patients could be ventilated easier and safer with the lower probability of lung injuries. In the ASV mode, the selection of tidal volume, an appropriate frequency for mandatory breathing and a suitable tidal volume for spontaneous breathing is made automatically based on mechanical properties of the respiratory system and target alveolar ventilation per minute. One of the advantages of this mode compared to other ventilation modes like pressure regulated volume controlled ventilation (PRVC) is earlier extubation after cardiac surgery (11). Tidal volume and the respiratory rate were calculated by using the Otis equation, which leads to the lowest effort of breathing. In this mode, tidal volumes are regulated through the microprocessors by careful and continuous monitoring of patients respiratory system. According to results, expiratory tidal volume in ASV mode is less than the mandatory breaths of SIMV mode, which was set by the operator. It seems that two factors contribute to the amount of tidal volume in ASV mode; the rate of breathing that increases the lower the tidal volume, and vice versa. These factors are not significant clinically in that they are established by machine microprocessors. The second factor is body weight correction and the use of ideal weight rather than the actual weight for calculations of tidal volume needed for ventilation. This factor is defined by the operator and needs more consideration. It seems that the use of weight correction could lead to the prescription of less tidal volumes (12). In present study, expiratory tidal volume in ASV mode was 6.8 ± 1.8 mL/kg. This amount was found to be less than conventional modes in other investigations. For example, 8.7 ± 1.4 ml/kg IBW in Casina et al. study (13) who found this ventilation mode applies lower tidal volume and plateau pressure to patients and allowed rapid extubation after cardiac surgery. The main difference between their study and ours is measuring the type of airway pressure. They evaluated plateau pressure that was significantly higher than our findings in peak pressure. Maybe the patients they selected were the main cause of this difference (cardiac surgery patients). Arnal et al. also found 8.3 ± 1.3 mL/kg IBW, which is the mean tidal volume used for ventilation in ASV mode in polyvalent ICU patients, which reported no incident with the use of this mode (14). In fact, due to respiratory monitoring and automatic adjustment of proper tidal volume in the ASV mode, we can reach the minimum respiratory work also the least resistance load and lung elasticity. In conclusion, it seems that using lower tidal volume with higher respiratory frequency (to maintain adequate minute ventilation) is the main strategy in ASV mode to decrease the effort of breathing. This finding could help and guide practitioners for better ventilation of patients. All of above findings was as favorable as our results. In this study, peak inspiratory pressure in the ASV mode is less than the SIMV mode. Petter et al. who compared the ASV mode with SIMV followed by pressure support in terms of weaning the patients after cardiac surgery from the ventilator observed lesser peak pressure alerts in the ASV mode (5). Additionally, ASV patients required fewer ventilatory settings manipulations (P < 0.05) and endured less high-inspiratory pressure alarms compared to standard protocol in their study. Tassaux D et al. found that during the ASV of patients with acute respiratory failure in the medical ICU the tidal volume increased and total respiratory rate decreased compared to SIMV-PSV ventilation mode (15). They showed that with AS, central respiratory drive was markedly reduced, suggesting decreased inspiratory load and improved patient-ventilator interactions in patients under partial ventilator support. In the Choi et al. study, maximum inspiratory pressure in patients with ARDS using the ASV mode is less than the volume-controlled ventilation (VCV) (24.6 ± 6.0 vs. 32.2 ± 6.8 cmH2O) (16). Actually, they found that after changing the mode of ventilation from VCV to ASV in ALI/ARDS patients, inspiratory and expiratory tidal volumes increased and conversely, the total respiratory rate and maximum pressure decreased. All of those changes mean the patients were better ventilated and ASV had provided better respiratory mechanics in terms of peak airway pressure and tidal volume than VCV. In fact, in the ASV mode the respiratory parameters are regulated automatically regarding the patients needs, which the lung has least resistance to. This feature of ASV mode could affect the maximum pressure and lead to the decrease of the P-Peak of the patient. In this regard present study supporting these finding and comparable with previous studies. This study showed that, respiratory dead space in ASV mode was less than SIMV mode. The ventilator machine computed the required minute ventilation based on patient’s IBW and subsequently estimated the patient’s dead space. Various studies have suggested that the increased dead space is related with the increase of patients’ mortality (17) and lower dead space could decrease the intrapulmonary shunt, which would improve the resultant complications (18). Bhalla et al. showed the initial and day 1 mean. The end-tidal alveolar dead space fraction was associated with the mortality in pediatric critical care unit (17). Although we didn’t assess mortality in our patients included this study, but decreasing dead space in ASV mode is obviously a useful finding in lung mechanics. While this paper is not about the duration of ventilation and its difference in different respiratory modes, many of the studies were conducted on the effect of ventilation types and the time of deterring. Numerous studies suggested using the ASV mode for lowering ventilation time (19, 20). According to lower peak airway pressure, better compliance and less respiratory dead space, which causes less work of breathing, lower ventilation time of patients by ASV mode is reasonable (21). Generally, we found that applying the ASV mode can lead to improved ventilation conditions compared to SIMV, but reducing the medication and hospitalization time that consequently could lower the expenses of the health system in intensive care units is not evaluated in our study and it could be suggested to other researchers. Undeniably, the increase of number of patients and the number of studies on patients with more acute respiratory diseases, such as ARDS, further studies are recommended concerning the effect of this mode on pathological lung cases. Subsequently, in the ASV mode, the lower tidal volume is specified by the processor than the regulated volume in SIMV mode for the patients (6.8 mL/k). We recommend the same amount used for ventilation of patients instead of more volumes in traditional modes (8 - 12 mL/kg in VCV or SIMV). The time of extubation, ICU staying time and patients’ mortality wasn’t evaluated in our study. We highly appreciate those who accompanied us in this research project, especially the members of the research committee of the anesthesiology department, research deputy Medicine faculty, Iran University of Medical Sciences, and the professional personnel of the neurosurgical ICU of Firoozgar hospital. Authors’ Contribution: Study concept and design: Mohammadreza Ghodrati, Alireza Pournajafian; data collection: Mohammad Hosein Hemadi, Mohammad Mahdi Zamani; analysis and interpretation of data: Ali Khatibi, Mohammad Niakan; drafting of the manuscript: Mohammadreza Ghodrati, Mohammad Hosein Hemadi; study supervision: Mohammadreza Ghodrati, Alireza Pournajafian; review of manuscript: Mohammadreza Ghodrati, Ali Khatibi; revision of the manuscript: Alireza Pournajafian. Funding/Support: Firoozgar hospital, vice chancellor of research of IUMS.